The Land of Israel is sitting on the western edge of the Arabian Tectonic Plate as it slides north/south along the side of the African Plate, which is pushing into the Anatolian Tectonic Plate, also north and south. 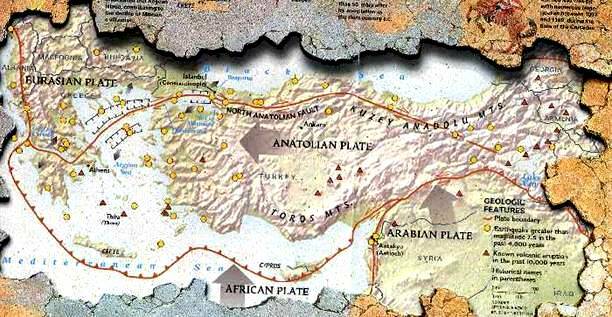 Yet the Anatolian Plate is sliding east and west along the Eurasian Plate. As can be imagined, this is a very unstable part of the world and the site of some of the major catastrophic disasters recorded in the history of man. The yellow circles are areas where earthquakes greater than 7.4M have occurred in the last 4000 years and the red triangles are known volcanic sites. Velikovsky on Exodus and Mount Sinai: “The earth groaned; for weeks now all its strata had been disarranged, its orbit distorted, its world quarters displaced, its oceans thrown upon its continents, its seas turned into deserts, its mountains up heaved, its islands submerged, its rivers running upstream – a world flowing with lava, shattered by meteorites, with yawning chasms, burning naphtha, vomiting volcanoes, quaking ground, a world enshrouded in an atmosphere filled with smoke and vapor. One of the quickest ways to see the handprint of the Lord of hosts with his people, the children of Israel is to look at their history of catastrophes and how they perceived the Lord becoming involved in their lives. Let us look at eighteen examples. In the Book of Genesis, the record depicts that the waters over the face of the earth were collected into oceanic basins and the continents appeared. Psalms 104:5-6 – “You who laid the foundations of the earth, so that it should not be moved forever, You covered it with the deep as with a garment; the waters stood above the mountains (before Creation). At your rebuke they fled; at the voice of Your thunder they hastened away. They went up over the mountains. They went down into the valleys, to the place which You founded for them (the seas and oceans). You have set a boundary that they may not pass over, that they may not return to cover the earth. According to scripture the angelic world was involved if nothing more than an observational and supporting role in the creation event. Job 38:4-7 – “Where were you when I laid the foundations of the earth? Tell Me if you have understanding. Who determined its measurements? Surely you know! OR who stretched the line upon it? To what were its foundations fastened? Or who laid its cornerstone, when the morning stars sang together, and all the sons of God shouted for joy? The effect of God’s judgment in the Noachian Flood was the rupturing of the tectonic plates and the waters under the earth; the massive fountains beneath the continental crusts erupted, flooding over the surface of the earth. The flooding came from two sources, from the top down (rain) and the bottom up (rupturing of the tectonic plates). A good source to understand this process is an article by geologist and sedimentologist Art Chadwich Ph.D. called “A Creation/Flood Model”. Noah and the Great Flood is presently on the website in a five part series under World of the Ancients. 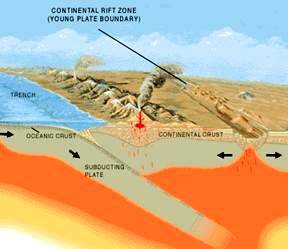 With our present understanding of the continental plate tectonics, this massive catastrophic event was caused in part by earth rending earthquakes and volcanoes. Genesis 10:25, 1 Chronicles 1:19 – To Eber were born two sons; the name of one was Peleg, for in his days the earth was divided; and his brother’s name was Joktan. Book of Jasher 7:19 – “To Eber were born two children; the name of one was Peleg, for in his days the sons of men were divided, and in the latter days, the earth was divided. 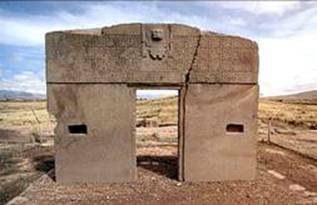 And the name of the second was Yoktan, meaning that in his day the lives of the sons of men were diminished and lessened. Peleg was the fifth generation descendant from Noah. Of all the descendants, yet it was Peleg in which a commentary statement was made, ‘for in his days the earth was divided.” Many theologians have claimed that this statement is in reference to the division of the sons of Noah at the Fall of Babel episode, yet the scripture is clear, ‘the Earth was divided.” For BibleSearchers this is significant. A literal interpretation is always preferred unless the Lord of hosts claims that it is symbolic and especially if the symbol is interpreted. Since the names of Hebrew, as well as most inhabitants, were significant to a specific character or event in their life, it would be interesting to note what “Jared” means in Hebrew. Strong’s Exhaustive Concordance of the Bible (#6388) states that Peleg actually means, “earthquake”. How coincidental? The clues are right in front of our eyes. Yet, Jared actually comes from a primary root word called, Palag, called paw-lag’ meaning to split or divide. Let it come at face value, earthquake, split and divide and add ‘for in his days the earth was divided, we have a major catastrophic event recorded in human history. Comparing the textual references from Genesis to the Book of Jasher, we see a subtle difference and a marked contrast. In Jasher, we note, that in Jared’s days, the sons of men were divided and the earth was not divided until the latter days of his life, close to his death. On the other hand, his brother, Joktan, the upheavals resulting in the cataclysmic changes that altered the environment around the earth resulted in the marked diminishing of the length of the lives of his descendants. Whereas the fountains of the deep were broken up in the Flood of Noah, the one continent world, known in geological terms as Pangaea, was still intact. A human, in the days of Noah and Jared could walk from the eastern coast of China, across Eurasia, the continent of the Americas without having to cross any oceans. That’s correct; the world was one continent, Pangaea. 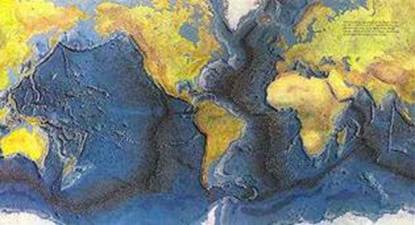 We will be talking about this continent called Pangaea later in The Catastrophic Destruction of Pangaea. 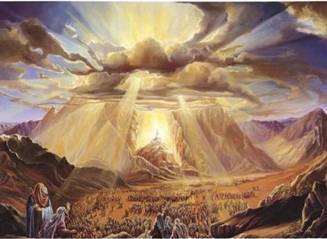 Genesis 19:23 – “The sun had risen upon the earth when Lot entered Zoar. Then the Lord rained brimstone and fire on Sodom and Gomorrah, from the Lord out of the Heavens. So He overthrew those cities, all the plain, all the inhabitants of the cities, and what grew on the ground. But his wife looked back behind him, and she became a pillar of salt. And Abraham went early in the morning to the place where he had stood before the Lord. Then he looked towards Sodom and Gomorrah and towards all the land of the plain and He saw, and behold, the smoke of the land which went up like the smoke of a furnace. element of a volcanic eruption, but it was much more. Unknown to Abraham, he was a living witness for only a few miles away the formation of the largest rift or fissure in the mantle of any continent on this earth was in progress, the Great Rift of Africa. We do not know whether this rifting began at the border of Lebanon and went south or began at the southwestern coastline of Africa at Beira, on the coast Mozambique at the fracture point of where the unique island of Madagascar split off the African continent. So did this rift work up through the Red Sea to the Vail of Siddim? We do not have evidence of Abraham’s reaction or response to this event, but the proximity of where he was living; the impact of this event would have physically affected him and all of his family. 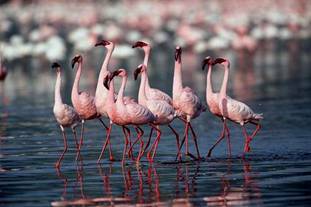 The 4000 mile (6,400 kilometers) length of the Great Rift Valley dwarfs the famous 780 miles of the San Andreas rift along the California coast and maintains an average width of 30 – 40 miles. Geologists date the rift to the era of the Pliocene Epoch. 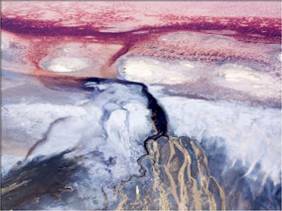 It was caused by a deep, linear, transcurrent or what is called a strike-slip fault along the Arabian and the African Plates. Yet the geologists date is to some 2 million to 7 million years ago. So what are creationists to think? If we can believe the theories of the speed of light is decaying by astrophysicist, Barry Setterfield Ph.D., then this decay is what is called the red shift in the universe since the Creation Event. To Setterfield, the speed of light has slowed down 10 million times (10,000,000) to its present stable state of 167,000 miles per second. The issue of light-speed in the early cosmos is one that has received some attention recently in several peer-reviewed journals. Starting in December 1987, the Russian physicist V. S. Troitskii from the Radiophysical Research Institute in Gorky published a twenty-two page analysis in Astrophysics and Space Science regarding the problems cosmologists faced with the early universe. He looked at a possible solution if it was accepted that light-speed continuously decreased over the lifetime of the cosmos, and the associated atomic constants varied synchronously. He suggested that, at the origin of the cosmos, light might have traveled at 1010 times its current speed, or 1 billion times faster. He also concluded that the cosmos was static and not expanding. Dr.Van Flandern was also involved in setting the parameters for running the clocks in the Global Positioning System of satellites used for navigation around the world. When he compared his clock determinant with the dynamic standard, it showed that the atomic phenomenon was slowing up to the year of 1980. According to Setterfield, the ‘c’ decay curve apparently bottomed out around 1980 CE and may have started to increase again. Since the speed of light is the recognized constant for Time, and affects all atomic ‘constants’ used in science since the moment of the Big Bang to this day then from the scientific evidence of the decay of the speed of light geological time has decayed from the moment of the Big Bang. Setterfield took this information and recalculated the historical story of man as recorded in the Bible. As such he was able to define a relationship between the dates of biblical historical time of the age of man and compare it with atomic or geological time. In this instance, 2-7 millions years in geological time would be the years of Peleg and Reu, when the scripture stated that in the days of Peleg, the earth was divided. 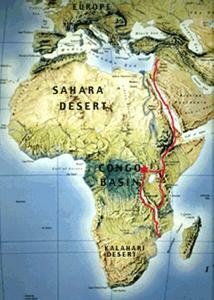 From that date the great Rift Valley division began at the time between Peleg and his son Reu about 3005-2875 BCE. 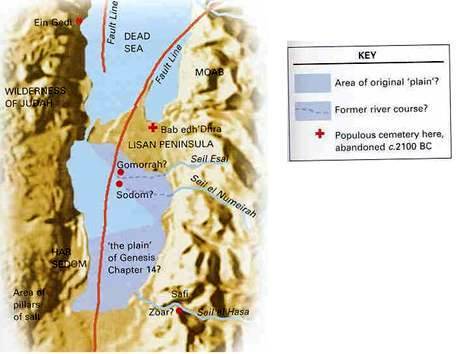 The implications are that this rifting began about five generations before Abraham and finished at the time of the destruction of the Sodom and Gomorrah. The works of Barry Setterfield Ph.D. are obviously controversial, but they do answer a question that has been plaguing short age creationists for years on how to relate to the difference between geological time and historical time. The following is a time chart on the age of the patriarchs of the Old Testament in historical and geological times. All along this great rift system from the Jordan River to southeastern Africa are evidence of deep depressions and wall-like cliffs as it carves a deep scar into the surface of the earth. All along this depression are relics of extinct or dormant volcanoes, evidence of the action of three tectonic plates moving away from each other. In the arena where the Great Rift splits into a Western Rift it hosts some of the deepest lakes in the world (up to 1,560 meters deep) and between it and the western wall is a depression hosting the second largest inland body of water, the famous Lake Victoria filled with up to 200 to 250 centimeter of rain per year. The Mediterranean Sea in the days of the antediluvians was known as the Valley or the Veil of the River of Styx, which itself is has over 300 megalithic sites of ancient cities submerged within its waters. 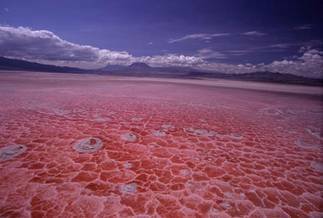 The floor of the valley between the Eastern and the Western Rifts boasts some of Africa’s most beautiful topography of lakes, plains, deserts, volcanoes with cliffs or escarpment rising on the edges upward to 3,000 feet from the floor of the valley and along the margins of the rifts. Some scientist are saying today that we are still seeing the formation of what will eventually be another sea, such as the Atlantic, in which the rifting causing the separation of the African and the Arabian tectonic plates will eventually be torn away and the Indian Ocean will flood away making the easternmost corner of Africa, called the Horn of Africa, a large island. Recently scientists have been watching the molten core at the center of the earth. This core is as hot as the sun and the magma convection currents rise and fall from the core to the earth’s crust much like a lava lamp. What is known is that the core of the earth, smaller than the crust of the earth spins at a faster rate. This spinning will cause the soft magma to twist and spiral and feeds like an electric generator. The reason: the twisting and spiraling of the magma rising from the molten iron core acts like an electric dynamo resembling the copper wire winding in an electric generator. Mega voltages of electric currents flow up to the surface of the earth between the positive and the negative poles. As such the magnetic field surrounding the earth is produced by the electric current flowing upwards from the molten core within this planet. Recent evidence of hot spots within the Pacific Ocean which are causing the El Nino and the El Nina planetary weather changes are a result of this dynamic process in the center of the earth. In the midst of the 16th century BCE, during one of the greatest volcanic explosions known to mankind, a group of slaves escaped from their masters in Egypt and changed forever the words called “reclamation, redemption, and restoration”. Moshe (Moses), the heir apparent to the throne of Egypt was born about 1665 BCE and fled Egypt in 1625 BCE, only to return at the age of 80 years, about 1585 BCE. It was here that Moses led his people, the children of Jacob, out of the land of Egypt. He set them marching towards their Promise Land, the land of Canaan. This was close to the time of the 13th dynasty in the Middle Kingdom and just prior to the chaos in the land when the Hyksos invaders took over the land of the Nile River. The plagues as recorded in Exodus record a phenomenon that eventually wrecked the economy and military power of Egypt, wiping out the 13th dynasty and allowing foreign rule to take over the land of Egypt. In the archives in Leiden, Netherlands, a papyrus document called the Ipuwer Papyrus gives what appears to be an Egyptian account of the Hebrew Exodus. Let us look at a comparison of this amazing papyrus and the Exodus account of Moses and the children of Israel leaving Egypt. "... there is blood throughout all the land of Egypt." "... there was not a house where there was not one dead. ... there was a great cry in Egypt." 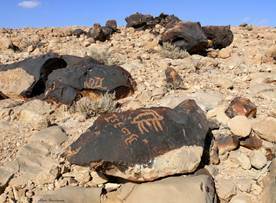 "Forsooth, the desert is throughout the land. The nomes are laid waste. A foreign tribe from abroad has come to Egypt." "That is our water! That is our happiness! What shall we do in respect thereof? All is ruin." "... and the river stank." "It is groaning that is throughout the land, mingled with lamentations." "... this night ... against all the gods of Egypt I will execute judgment." "Forsooth, those who were in the place of embalmment are laid on the high ground." "And it came to pass, that at midnight the Lord smote all the firstborn in the land of Egypt, from the first born of Pharaoh that sat on his throne unto the first born of the captive that was in the dungeon." "Trees are destroyed. ... Years of noise [hrw]. There is no end to noise." "All animals, their hearts weep. Cattle moan ..."
"... the hand of the Lord is upon thy cattle which is in the field ... there shall be a grievous moraine." "... gather thy cattle and all that thou hast in the field ..."
"Forsooth, that has perished which yesterday was seen. The land is left over to its weariness like the cutting of flax." "Would that there might be an end of men, no conception, no birth! Oh, that the earth would cease from noise and tumult be no more!" "No fruits nor herbs are found. ... hunger. ... Oh, that the earth would cease from noise, and tumult (uproar) be no more." "... and the hail smote every herb of the field, and brake every tree of the field." "... the fire ran along upon the ground. ... there was hail, and fire mingled with the hail, very grievous." "... the flax and the barley was smitten: for the barley was in the ear, and the flax was boiled. But the wheat and the rye were not smitten: for they were not grown up." "Behold, the fire has mounted up on high. Its burning goes forth against the enemies of the land. ... weep ... the earth is ... on every side ... weep." "The residence is overturned in a minute." "...all the waters that were in the river were turned to blood." "... there was blood throughout all the land of Egypt. ... and the river stank." "Behold, the chiefs of the land flee." "The land is not light ... "
"... and there was a thick darkness in all the land of Egypt." "Men flee ... Tents are what they make like the dwellers of the hills ..."
"Lower Egypt weeps. ... The entire palace is without its revenues. To it belong (by right) wheat and barley, geese and fish. The storehouse of the king is the common property of everyone." "... and there remained not any green thing in the trees, or in the herbs of the fields, through all the land of Egypt." "Today fear ... more than a million of people. Not seen ... enemies ... enter into the temples ... weep." Men ... They have come to an end for themselves. There are none found to stand and protect themselves." "What has happened? ... through it is to cause the Asiatics to know the condition of the land." So how did the Israelites accumulate their immense wealth? According to Ipuwer, the children of Israel had common access to all the stored wealth of gold and jewels and all the relics of veneration in the temple of Egypt at their disposal. Here at this historic junction, Egypt was entirely defenseless. Forty years prior they had conquered Nubia. Now with the armies of Egypt at the bottom of the Red Sea, the pharaoh and the mighty men of Egypt rested. Whereas Egypt was overtaken by foreigners, it was truly Acts of God which destroyed the entire land. On August 26, 1883, the world witnessed the largest volcanic explosion in modern times on the Island of Krakatoa near Java and Sumatra. Here are a few accounts of this massive explosion. "Ships navigating the seas in the vicinity of Krakatoa reported that floating pumice in some places had formed a layer about 3 m thick. Other shops, 160 miles off, reported that they were covered with dust three days after the end of the eruption. In fact the dust cloud completely shrouded the area, so that it was dark even 257 miles away from the epicenter. 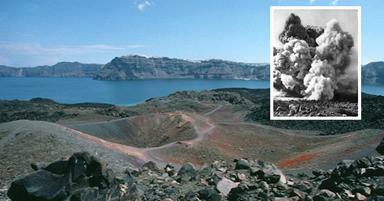 In the fifteenth century another famous volcano exploded, this one on the Island of Santorini, called Thera. 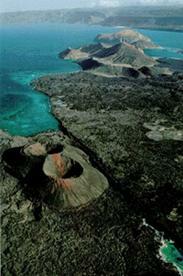 Today this island is a remnant of its former glory with a sunken crater in the center. Yet the archeological evidence depicts that this volcanic explosion swept southeast from the Aegean Sea, across the Mediterranean to the coast of Egypt, Sinai, southern Canaan and into Arabia. 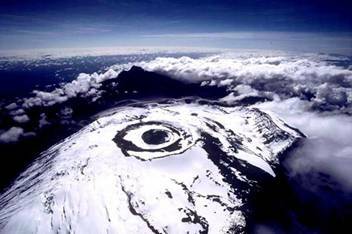 According to the VCI, the volcanic index (VEI), as recognized in the Journal of Geophysical Research 87, 1231-1238, a volcano is estimated as to the explosive magnitude for historical volcanism. A category 6 volcano is one of ‘colossal’ measurements with plumes of magma erupting into the stratosphere for over 10 miles (25 km), and a displacement volume of between 10 and 100 ks km. Both Krakatoa and Thera were rated at a VCI of 6. The Thera eruption occurred according to the dating of pottery in the fifteenth century time frame, or well within the traditional dates of 1450 BCE for the Exodus of the Israelites from Egypt. On the other hand, dendrochronology and radiocarbon dating supports the historical record yet placing a little later at 1628/7 B.C.E. Revised chronology according to Barry Setterfield suggest that the Exodus was dated at 1575 BCE. Classical literature leaves the following tale of the great explosion of Thera. "On the west coast of Turkey, just north of the island of Rhodes*, is a small body of water whose shoreline is like an ever-narrowing funnel. Its open mouth faces west, toward Thera, and anyone living behind that mouth might just as well have been a flea located in the throat of a cannon. As the shock wave surged east between increasingly confined shorelines, the waters piles higher and higher until at last they became a foaming white mountain eight hundred feet tall. It was the Greek playwright who wrote sometime between 480-406 BCE. "According to the oral tradition handed to Euripides [who lived on the west Aegean between 480 and 405 B.C. ], a wall of water heaved up from the deep, into a sky as clear as glass. So here we have ‘the rest of the story” behind the great escape led by Moses, the former heir apparent to the throne of Egypt. Any re-interpretation of this event must be in light of the cosmic, atmospheric and catastrophic tectonic changes with earthquakes and volcanoes in the land of Egypt. Exodus 14: 2-3 - “Speak (Moses) to the children of Israel, that they turn and camp before Pi Hahiroth, between Migdol and the sea, opposite Baal Zephon; you shall camp before it by the sea. For Pharaoh will say of the children of Israel, they are bewildered by the land; the wilderness has closed them in. Psalms 77:18 -20 – “The clouds poured out water; the skies sent out a sound; your arrows also flashed about. The voice of Your thunder was in the whirlwind; the lightnings lit up the world; the earth trembled and shook. Your way was in the sea, Your path in the great water, and Your footsteps were not known, You led Your people like a flock by the hand of Moses and Aaron. 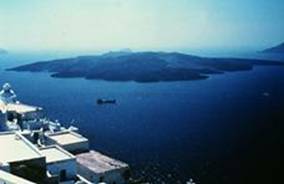 In light of our current knowledge about the Exodus and its possible relationship with the volcanic eruption on the island of Thera or Santorini, we know by now that earthquakes and volcanoes simultaneously occur in these earth shaking events. 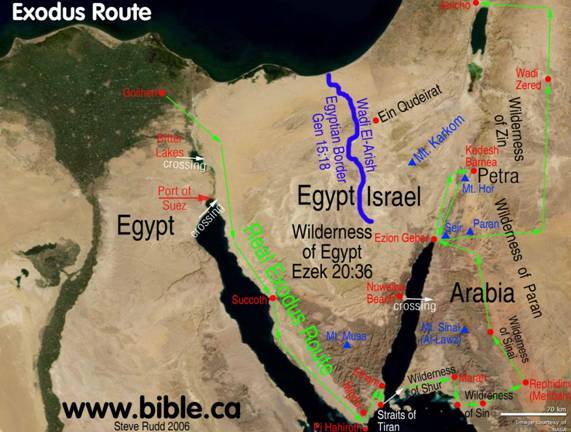 And so, the Exodus escape would be ranked as one of the major earthquakes in Biblical history. The fear of the people of Israel was in part due to the post-traumatic stress syndrome that occurred in the land of Egypt, and this journey is capture is this memorable Psalm. This is also a psalm for the end of times, for those, the remnant, who will be participants in the Greater Exodus either as members in the final millennial kingdom with Yahshua reigning as King of kings and Lord of lords with an iron rod in His mouth, or those saints who will be spiritually raptured into another dimensional state at the revealing of the Messiah. Exodus 19:16-21 - “Then it came to pass on the third day, in the morning, that there were thunderings and lightnings, and a thick cloud on the mountain; and the sound of the trumpet was very loud, so that all the people who were in the camp trembled. the house of Jacob from a people of strange language. Judah became His sanctuary, and Israel His dominion. 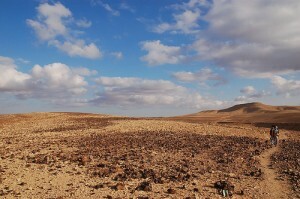 The Traditional Site of Sinai in the Sinai Desert. This claim was rejected by Beke’s contemporaries and even later by himself. (The Late Dr. Charles Beke’s Discoveries of Sinai in Arabia and of Midian (1878), pp 436, 561 cited by Velikovsky ibid) Scholars today are not so sure and multiple sites have been proposed, yet most look for a site among the volcanoes in the region of Mount Seir. 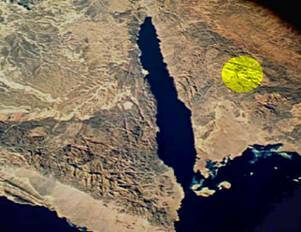 Yet the entire Sinai Peninsula is covered with basaltic formation of ancient volcanic eruptions. All the way from Palmyra into the depths of Arabia at Mecca, lava formations and extinct volcano tops are noted. The violent forces of nature are seen vividly in the Samuelic picture is also recorded in Psalms 18:7-15. 2 Sam 22:8-18 – “Then the earth shook and trembled (earthquakes); The foundations of heaven quaked (celestial quakes) and were shaken, because He was angry. Smoke went up from His nostrils (volcanic eruptions), and devouring fire from His mouth; coals were kindled by it. He bowed the heavens (warping space and time) also, and came down with darkness under His feet. He rode upon a cherub (the flying vehicle in which four cherubim carried the throne of God), and flew; and He was seen upon the wings of the wind; He made darkness canopies around Him, dark waters and thick clouds of the skies from the brightness before Him coals of fire (coals always were burning under the throne of God) were kindled. The Lord thundered from heaven, and the Most High uttered His voice; He sent out arrows (bolides of fire) and scattered them (meteor showers); lightning bolts (celestial lightning), and He vanquished them. The channels of the sea were seen (oceanic rift systems), the foundations (continental tectonic plates) of the world were uncovered. The Alexandrian philosopher Philo is credited with the following statement about the commotions of earth and in the heavens. The earthquakes that accompanied the Mount Sinai experience produced an incessant noise and groaning as the continental plates rocked and swayed, grinding against each other. These groanings and deep sighing sounds were attributed by the ancients to the gods and called ‘theophany”. Immanuel Velikovsky - “It was a perfect setting for hearing words in the voice of nature in an uproar. An inspired leader interpreted the voice he heard, ten long, trumpet like blasts. The earth groaned: for weeks now all its strata had been disarranged, its orbit distorted, its world quarters displaced, its oceans thrown upon its continents, its seas turned into deserts, its mountains upheaved, its islands submerged, its rivers running upstream - a world flowing with lava, shattered by meteorites, with yawning chasms, burning naphtha, vomiting volcanoes, shaking ground, a world enshrouded in an atmosphere filled with smoke and vapor. Here arises the ethereal concept of the “music of the spheres” the Pythagorean idea that stars make music. Yet if the angels are called stars in the scripture, and the angels were the ones singing to the shepherd on the Judean hillside at the birth of Jesus, then the ‘music of the spheres” could also be the “music of the angels”. 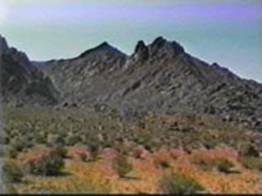 · Larry Williams, The Mountain of Moses, The Discovery of Mount Sinai (1990) reprinted under the title The Mount Sinai Myth (1990). · Howard Blum, The Gold of Exodus: The Discovery of the True Mount Sinai (1998a) reporting on the Williams-Cornuke expedition. · Bob Cornuke, In Search of the Mountain of God, "The Discovery of the real Mt. Sinai" (Cornuke and Halbrook, 2000). 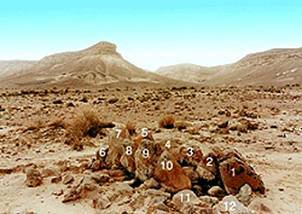 The Rock Pile of Twelve Stones near the base Mount Har Karkom as the site for Mount Sinai. 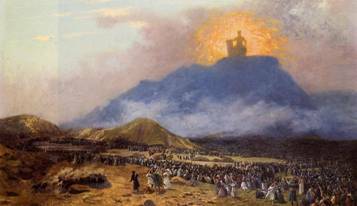 Allen Kerkeslager Ph.D – “Demetrius, Josephus, and other Jewish sources that identify Mt. 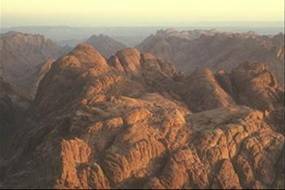 Sinai with a discernible location consistently place it in northwestern Arabia east of the Red Sea. This early Jewish tradition of location Mt. 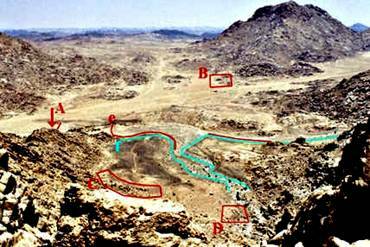 Sinai in northwestern Arabia continued to find expression in a number of early Christian sources both before and after the growth of the competing Christian tradition that located Mt. Sinai in the southern Sinai Peninsula. 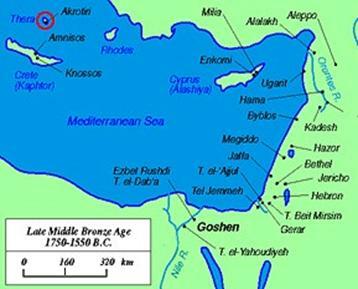 There is not a single piece of solid evidence that any Jew in the pre-Christian period ever located Mt. Sinai in the Sinai Peninsula. The notion that Mt. 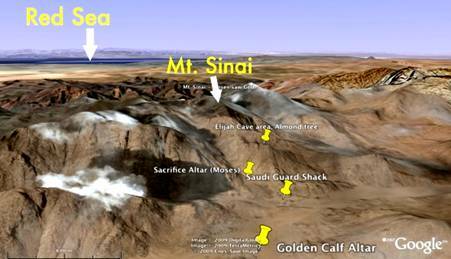 Sinai was located in the Sinai Peninsula must be understood as a purely Christian invention hardly different from the Christian identification of many other locations in the near East with ancient biblical sites. F. Aqua Lines mark Stone Fences. · The mountain must be near Al-Bad ancient Madyan. 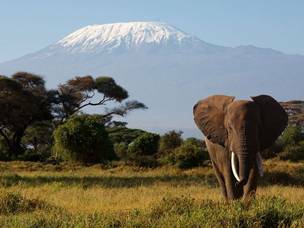 · The mountain must be the highest mountain in the surrounding region.This criteria is potentially decisive because it would limit one's options to just one mountain. · Jabal al Lawz is uncontested as the highest mountain in the region of ancient Madyan, Jabal al Lawz also fulfills every other criterion stated above. · Jabal al Lawz is probably the most convincing option for identifying the mountain with which Jews identified Mt. 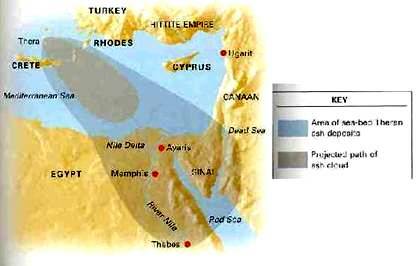 Sinai in the Hellenistic and early Roman periods. · Jabal al Lawz may also be the most convincing option for identifying the Mt. Sinai of biblical tradition. Cave painting on the mountain site suggests a holy place where pilgrims use to visit. According to Anati, these paintings include pictures of the menorah, Aaron’s rod with the brazen serpent, figures in prayer with outstretched hands and two figures with a pole and grapevine on it. These paintings seem to be unique to this locale. Yet to understand the events of Sinai, you must understand that the presence of the Lord of host includes all the phenomenal energy in the presence of His Being. Nobody stands quietly in the presence of an erupting volcano, yet the Lord of hosts stated that to do so was a statement of their trust in Him. The experience of the saints during the earthquake in the future 6th Seal and the 7th Trumpet of the 7th Seal will be with the same imagery as the power and fear generating experience felt by the Israelites at the base of the mountain. The world will tremble when the Lord of hosts makes His presence known. Numbers 16:23, 30-33 - “So the Lord spoke to Moses, saying ‘Speak to the congregation, saying. ‘Get away from the tents of Korah, Dathan, and Abiram.’” ….”But if the Lord creates a new thing, and the earth opens its mouth and swallows them up with all that belongs to them, and they go down alive into the pit, then you will understand that these men have rejected the Lord. This charge against the leadership chosen by the Lord of hosts has a common vein throughout all history, closely aligned with the charge of Satan to the Lord of hosts. For it was Lucifer, the guardian cherubim, who initiated the initial rebellion against HaShem, claiming that He does not have a right to command the will and allegiance of man, for it violates free will of man. Then the faithless spies began a disinformation campaign, about the mighty and powerful cities, about the giant descendants of Anak plus the feared enemy that sought their extinction in the Sinai, the Amelekites, but numerous other powerful tribes, they would have to confront violently in order to conquer and inhabit the land. Let us look carefully at this scenario. A rebellious group of camp leaders are now standing in the front of the Wilderness Sanctuary, all with censers. Another group of leaders are standing in armed rebellion by their tents. How was God going to answer their charges? They are now charged that the “people of the Lord” were the ones that were killed, suggesting that Moses and Aaron were evil imposters. This recognition by the rebelling Israelites was that Korah, Dathan, Abiram and the 250 consumed leaders were recognized spiritual leaders in the camp of Israel. As BibleSearchers, let us now digest and put on our spiritual eyeglasses. It is our belief that the chosen people of God, the Israelites were selected in part to be actors in a continuous drama with the Lord, and each mini-drama will be a scene that will be replayed in full at the end of times. Here we have a historical event, a mini-drama that may give us insight to the final chapters at the time of the end. The central issue is rebellion against God. So what do we see? Here we see the people of God once again standing on the border of the Promise Land. The evidence is real, it was truly a ‘land of milk and honey.’ Yet a disinformation campaign begins and a whole generation balks and rebel with only a “remnant” that will eventually go into the Land; the Calebs and Joshuas. For forty years they live in a world with a fear, of the progressive might of military forces and formidable political and power ‘giants’, a world soon be under the yoke of the oppressive power of an Anti-Christ driven one-world government, and the greed of men possessed with the want and lust of money and power. A whole generation strive for political and spiritual leadership, choosing to ignore the humble servants of the Lord within their midst. Political machinations will rip the core of the literal Israelites, as the orthodox tzaddiks, or righteous ones are relegated to cloisters and hidden chambers to worship and the reformed rabbis’ seek political power and dominance. The Roman Christian Church and their “daughters”, the no-longer Protest-ant Churches will also be shredded as they seek international political and religious hegemony on the spiritual sites in the Holy Lands. They seek to manipulate the populous in the political chambers with spiritual sounding rhetoric, such as the Silent Majority. They will seek political solutions for moral issues. And more and more the righteous are declared to be evil imposters and the wicked are portrayed as the servants of the Most High. Reality will become twisted and morality will become profane. As that generation dies off, only a remnant will be left. Again we see another rebellion at the end of times. This time, we see Two Witnesses, especially selected by God to lead his people to the doorway of the Promise Land and to protect them from the physical and spiritual onslaught against them by the evil ones siding with the forces of the beast, the Antichrist. This rebellion will be aimed directly at the sacred triad of the Lord’s; the physical presence in the land, whether it be Jerusalem or a Temple, the physical civil and spiritual leadership possibly led by the greatest of the lawgivers in the history of man, Moses, and the greatest of the prophets, Elijah. This revolt will be global and international and will absorb the attention of all the peoples of the world. The international ‘spiritual want-to-be leaders’ will seek power and authority by being in front of the very presence of the place God calls, My Holy Place, Jerusalem. They will seek to divide this Holy Soil amongst the religio-political leaders as has been the political promise given by Prime Minister Rabin in 1994 to the Pope for the Vatican to be the religious broker to make the Temple Mount as a place for Moslems, Christians and Jews to worship together. The international ‘political want-to-be leaders’ in a world sanitized by the one-world leaders of the United Nations will also seek spiritual sanction for their political dreams as Charlemagne the Great did when he was crowned by the Pope as the Holy Roman Emperor in the year of 801 CE. What a better place than the designated physical planetary capital of the Lord of hosts, Jerusalem, “that great city which spiritually is called Sodom and Egypt, where also our Lord was crucified.” (Revelation 11:8) In doing so, they will again set themselves up in defiance against God with their own ambitions of power, greed and control. They will challenge to the “Face of God” they He does not have the right to arbitrarily destroy them and to prove their point, they will gather together all the weapons of mass destruction at the doorstep of Jerusalem, on the plains of Megiddo. As these armed rebels then turn “towards the tabernacle of meeting”, where Vendyl Jones once predicted that the wilderness tabernacle will once again be found, they will seek to destroy it “and suddenly the cloud covered it, and the glory of the Lord appeared.” (Numbers 16:42) Yes, He, the Son of Man, now as King of kings and Lord of lords will come in the clouds and with the glory of the Lord, every eye shall see Him. “False Prophet of Islam” and he will be cast into the Lake of Fire. A complete Pole Reversal will occur. A great earthquake will again occur, one so big that all the mountains of the world will disappear and all the islands (oceanic mountains) will disappear. Revelation 16:17-21 – “Then the seventh angel poured out his bowl into the air, and a loud voice came out of the temple of heaven, from the throne, saying, “It is done!” And there were noises and thunderings and lightnings; and there was a great earthquake, such a mighty and great earthquake, as had not occurred since men were on the Earth. Now the great city was divided into three parts, and the cities of the nations fell. And great Bagbylon was remembered before G-d , to give her the cup of the wine of the fierceness of His wrath. Then from the deep tectonic plates beneath Jerusalem a rumble will begin that will get louder and louder, so immense that fear is instilled in everyone’s hearts. The African and Arabian plates will begin to slide away from each other. A massive uplift will raise up the Mountain of the Lord as all the mountains of the world will be in their process of devolution. The mighty Himalayas, the Andes, the Rockies, and all the mighty ranges of mountain heights “will disappear”. The forces jamming one continental plate into another for thousands of years that had caused their mountain uplift were now reversed in the complete physical Pole Shift. The armed rebels in Armageddon were soon to be destroyed by the might of the earthquake. The power of the glory of God and the billions of human tax dollars put into exotic weapons of catastrophic planetary mass destruction will now be utterly destroyed. Is this the final portrayal of this mini-drama of Korah and the rebellious leaders? As a BibleSearcher, if you are chosen to be among the remnant, you might be able to witness these awesome events with your very own eyes.